And so, the wettest British summer of all time continues. At least I’ve got no annual leave left, so I’m stuck safely away in an (almost) waterproof office all day. And I’m spending my evenings all curled up on the sofa with a blanket, Netflix, and thoughts of autumn leaves and pumpkins. So there’s that. I feel like today’s recipe combines a great summer classic – the fuzzy little peach – with something a little bit more autumnal. Does anyone else think of caramel as a fall flavour? Or is it just me? Maybe it’s the colour. Yep, I finally managed to combine my love of making meringues, with my favourite fruit, and the scrummiest sauce. Meet my Caramel Peach Pavlova. I’m never one to hide the truth, so I’m going to be blunt. This one’s a tad time consuming to make. You *could* cheat and buy a ready made meringue nest, but then you’d be missing out on the chewiest, carameliest brown sugar meringue around. My wife doesn’t like meringue, but she loved this one. It’s a whole new world of awesome. To make things a bit less daunting, I would recommend making the meringue nest a day (or even a week or two) ahead. It will stay fresh if you keep it in an airtight container somewhere cool – but not in the fridge. You can then roast the peaches and make the caramel on the day you want to eat it. Talking about roasting peaches, these caramelised peaches are pretty much a dessert all by themselves. You could definitely roast them up and just eat them with some vanilla ice cream, and sprinkled with some granola. Like a peach pie meets ice cream sundae meets cobbler. I’m obsessed with the roasting tray I stole/borrowed from my Mum’s house when we were down there a few weeks ago. She’s noticed it’s missing now though, so it has to go back. Sad face. She doesn’t understand how good it looks in photos! She just wants to cook oven fries on it. It’s also another outing for my all-in-one caramel sauce. 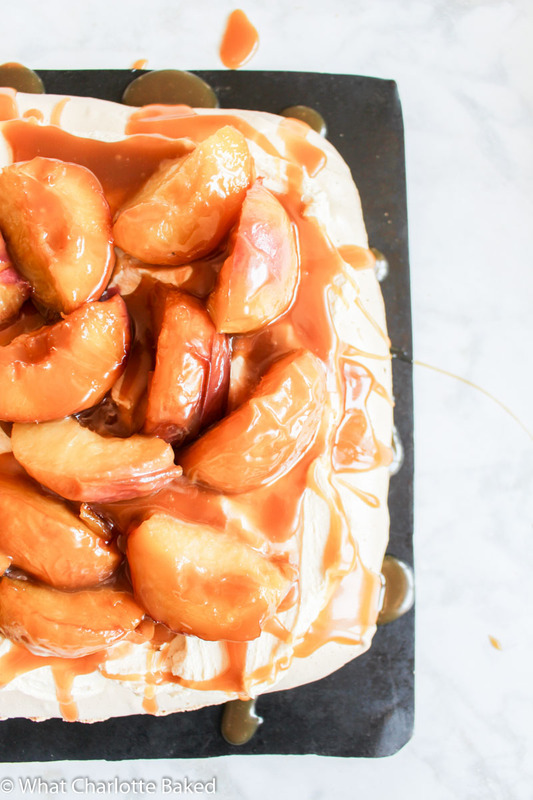 I will be sharing a post entirely dedicated to this wonderful sauce very soon, but in the meantime you can have a go at making my Salted Caramel Granola if you want something a little less daunting than this caramel peach pavlova. My all-in-one method makes a fantastic caramel sauce, and it never fails, unlike so many other caramel sauce recipes out there. You don’t even need a thermometer! 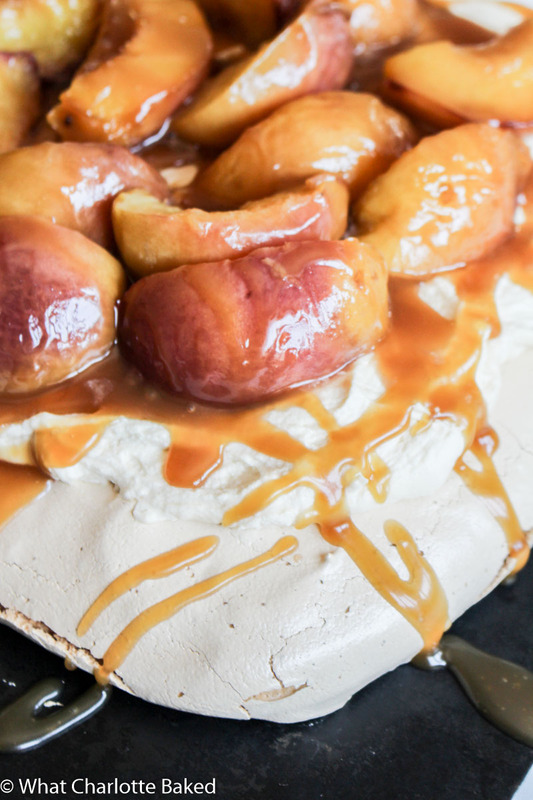 As well as being completely smothered in the stuff, this pavlova also has some caramel whipped cream nestled under those peaches. Because apparently there wasn’t enough caramel on your dessert plate already. If you’ve made my Ferrero Rocher Pavlova before, you’ll be familiar with how you’re going to flavour the cream. We’re going to thin the caramel sauce out a bit with some extra double or heavy cream, whip the rest of the cream up to stiff peaks, and then gently fold in the extra-creamy caramel. Easy, and tasty. That’s my motto. So yeah, whilst this isn’t something you can whip up in half an hour, it’s 100% doable. Give yourself time, don’t rush, and you will be amazed at what you can do. And meringues might be easy, but I can tell you something that’s far from it – the chocolate macarons I spent last weekend failing at. Four attempts later, I had something that almost looked like a macaron. But I’m still a fair way off being able to share a great recipe with you all. That one might have to go on the back-burner for now. In the meantime I will munch another plate of this caramel peach pavlova to drown my sorrows (in caramel). 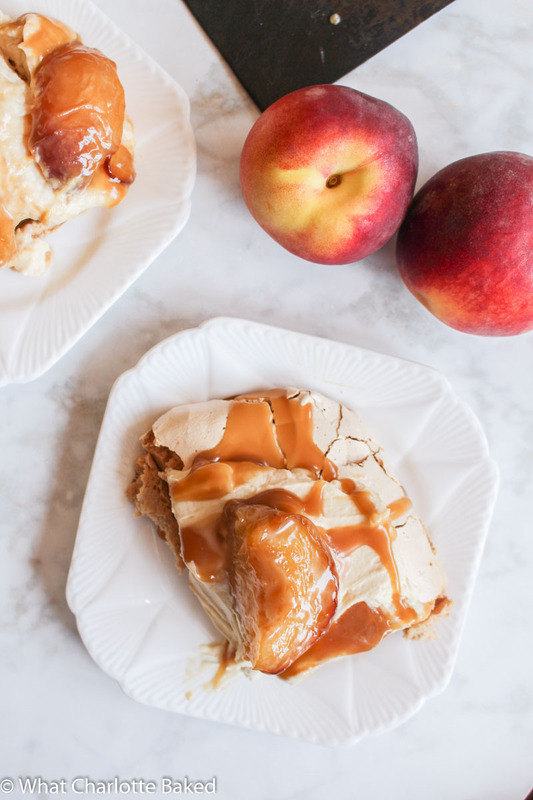 A caramel meringue filled with caramel cream and topped with roasted peaches and an easy all-in-one caramel sauce. An amazing summer dessert! Preheat the oven to 150°C / 300°F (130°C fan) and line a baking sheet with grease-proof paper or baking parchment. Grab a large bowl, or the bowl of your stand mixer, and make sure it is free from any grease. I like to rub the bowl with white wine vinegar or lemon juice to make sure it is completely grease-free, as this will help to ensure that your egg whites whisk up well. Place the egg whites into the bowl, along with the cream of tartar. Whisk on medium until the mixture has turned frothy, and then turn up the speed to maximum and whisk until the egg whites are white and fairly stiff. In a separate bowl, mix the brown sugar and cornflour together, and then add to the egg whites, one tablespoon at a time, whisking as you go. Continue to whisk the egg whites for about 5 minutes, until there are no sugar grains remaining. You can test this by rubbing a little bit of the mixture between your fingers. Add the vanilla extract and whisk for another 30 seconds. When the meringue is done, spoon the mixture onto the baking parchment. You are aiming to make a square shape, with higher sides and a lower middle (like a nest). I find it easiest to place spoonfuls of meringue around the outside of the square, and then fill in the middle. Make sure the outside of the meringue is nice and smooth using a spatula, and fill in any holes. Bake the meringue in the preheated oven for 1 hour and 45 minutes. Do not open the oven door to check on the meringue whilst it is baking. Once the 1 hour and 45 minutes is up, turn off the oven and leave the meringue in the oven with the door closed for at least an additional 1 hour (or overnight if easier). You can then remove the meringue from the oven and leave to finish cooling on the tray (if necessary). Preheat the oven to 200°C / 400°F (180°C fan). In a saucepan, heat the butter, sugar and vanilla on medium until the butter has melted and the sugar has completely dissolved, stirring occasionally. Remove from the heat. Chop the peaches in half and remove the stones. Place the peaches cut-side down onto a roasting tin. Pour the melted butter and sugar onto the peaches and roast in the oven for about 20-25 minutes. The peaches should be soft and tender. 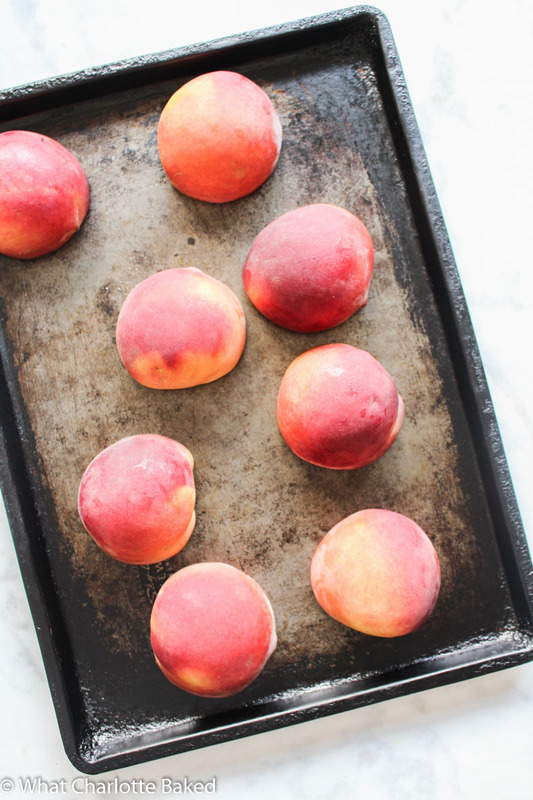 Remove the peaches from the tray as soon as they are cool enough, and set aside for later. Place all the caramel sauce ingredients into a large saucepan and stir together. Heat on a low temperature until the sugar has dissolved. Turn up the heat to medium and bring to a gentle bubble. Once bubbling, stir occasionally and cook for 2-3 minutes until golden, and then remove from the heat. The sauce should resemble syrup at this point. Set aside and leave to cool. Once the caramel sauce has cooled, pour 200g (¾ cup) of it into a small bowl. Add 120ml (½ cup) of double or heavy cream to the bowl, and stir together with a spoon until combined. Set aside. Whip the remaining 360ml (1½ cups) of cream up to stiff peaks in a separate larger bowl. Once whipped, add the caramel cream to it, and then gently fold together to avoid losing any of the air. Place the meringue on to a serving plate, as it will be hard to move once assembled. Spoon the whipped caramel cream into the middle of the meringue and spread out using a spatula or the back of a spoon. Chop the caramel peach halves in half again, and place on top of the cream in an even layer. Drizzle with as much of the remaining caramel sauce as you like! The pavlova is best served on the day it is made. Keep the pavlova in the fridge before serving. The baked and unfilled meringue nest should stay fresh for up to 2 weeks if kept in an airtight tin (not in the fridge). You can then roast the peaches and fill on the day of serving.